Liberation Day is a public holiday in Jersey that commemorates the end of the island's occupation by Nazi Germany during the Second World War. 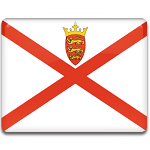 It is celebrated on May 9 as the national day of Jersey. During WWII, the Channel Islands were demilitarized, and some of their citizens were evacuated to the United Kingdom. In Jersey, however the majority of the islanders decided to stay. The island of Jersey was occupied by Nazi Germany on July 1, 1940. Nazi Germany surrendered on May 8, 1945. Jersey was officially liberated on the next day. HMS Beagle arrived on May 9 to accept the surrender of the occupying forces. The Union Jack was hoisted at the Harbour Master's Office to mark the end of the occupation. This ceremony has been re-enacted annually on the occasion of Liberation Day. Liberation Day has been a public holiday in Jersey since 1952. Official celebration typically includes a special sitting of the States of Jersey (the island's parliament and government), a parade, an ecumenical service, and a re-enactment of the flag hoisting. A solemn official ceremony is also held at the memorial dedicated to victims and slave workers of different nationalities. Informal community celebrations are held in the afternoon.